For more than 20 years, Julianne Moore has proven herself to be one of Hollywood’s finest actresses. It is no surprise that the versatile and supremely talented Moore has been snapped up by directors the calibre of Robert Altman (Short Cuts, Cookie’s Fortune), Paul Thomas Anderson (Boogie Nights), Todd Haynes (Far from Heaven), Alfonso Cuaron (Children of Men) and David Cronenberg (Maps to the Stars). Equally at home in drama, comedy or blockbuster action franchises such as The Hunger Games series, the fact that Moore is yet to be recognised with an Academy Award (despite five nominations) is more a reflection on the vagaries of the process and the politics of the industry rather than her worthiness of such an honour. With her latest performance as a linguistics professor diagnosed with early-onset Alzheimer’s in Still Alice, Moore may finally find herself in possession of that gold statuette. As Alice Howland, Moore delivers an indelible portrayal of an intelligent, self-assured 51-year-old woman whose rapid decline from this most debilitating of diseases is heartbreaking to watch. Having overcome the tragedies of her youth – an alcoholic father, the death of her mother and sister in a car accident – Alice has forged a path to success. A mother of three and an academic of high regard at Columbia University, a series of memory lapses – the type that most of us would probably dismiss as insignificant but cause much more concern for somebody whose entire identity and self-worth are defined by her intellect – sees Alice consult with a neurologist. The news is all bad and Alice is diagnosed with this most virulent strain of the disease that progresses more swiftly than usual. Adding to Alice’s torment is the fact that the disease is genetic and there is a significant chance she has passed it on to her children. As we track Alice’s rapid deterioration, Moore shines as a woman who, whilst appearing remarkably stoic on the surface, is terrified at the prospect of what the future holds; a fear that is expressed by Moore through her facial expressions as much as anything she says. You can see her frustration when words fail to materialise and sense her growing confusion as she becomes increasingly detached from the world around her. Moore never resorts to histrionics in her portrayal, conveying Alice’s mental imprisonment with economy and grace. As the reality of her situation becomes a battle between the intellectual and the emotional, Alice sets out to prepare her future self for a way out when the time comes. This is the type of the movie that could very easily slip into movie-of-the-week melodrama if not for the strength of the performances from Moore and Kristen Stewart as youngest daughter Lydia, the only one of her children willing to put their own life on hold to assist as Alice’s condition deteriorates rapidly. Stewart once again proves that, with the right material, she is an actress of considerable capacity and she is good as the family outcast who puts her own aspirations as an actor on hold. It could be argued that Stewart’s character trivialises acting as a career choice – she is broke and neither her mother nor her siblings take her seriously – and this is true to a certain extent, but Lydia emerges as the most rounded supporting character in Alice’s crumbling world. Alec Baldwin plays Alice’s medical researcher husband who, despite an enduring love for his wife that never waivers, doesn’t know how to balance the demands of her illness with his own ambitions, while Kate Bosworth is Anna, the vile, self-absorbed older daughter who shows little regard for anybody but herself. There is nothing flashy in the direction from Richard Glatzer and Wash Westmoreland, which is in keeping with the mood of the piece. Anything too ostentatious would only serve to trivialise the plight of the characters. In fact, the film isn’t particularly cinematic at all and there is certainly nothing here for those who like their films fast paced and full of action. 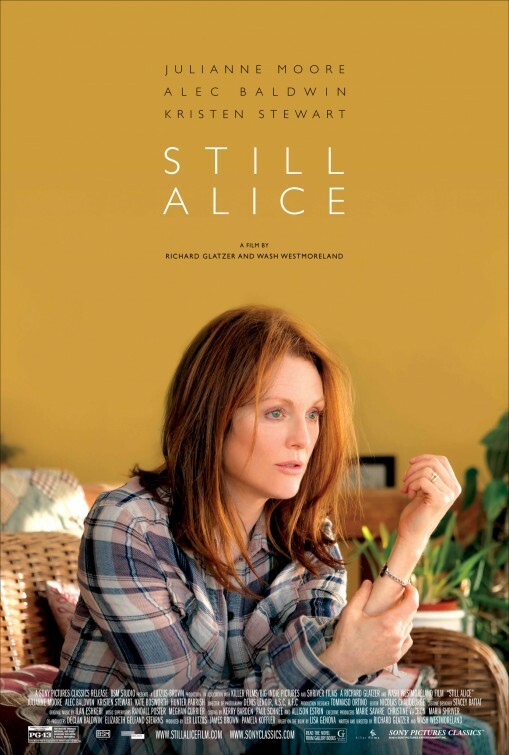 However, for those who like their movies to provide some kind of insight into the human experience, Still Alice should certainly fit the bill. Make no mistake; this is a sad story that is difficult to watch at times due to Moore’s remarkably affective performance that is deserving of whatever accolades come her way.